One New Aftermarket Replacement Pair of Right Hand & Left Hand Side Hood Moldings (with Raised Lettering) for John Deere Tractor models: 1010, 2010, 2510, 2520, 3010, 3020, 4000, 4010, 4020, 4320, 4520, 4620, 5010, 5020.- Painted & Ready for Installation. JD New Generation Side Moldings. Includes Mounting / Retaining Clips. Pair Contains: 1 RH Side Molding # AR28048, & 1 LH Side Molding # AR28049. Just like they came right from the Factory. Only the 48 contiguous States in the U. 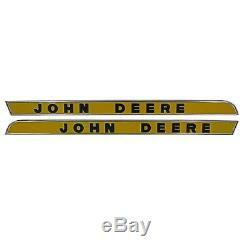 The item "2 John Deere RH / LH Side Hood Molding Raised Letters 2510 3020 4000 4020 4320" is in sale since Thursday, January 09, 2014. This item is in the category "Business & Industrial\Heavy Equipment Parts & Accs\Antique & Vintage Equip Parts".